The villain this time was The Riddler, who would often leave cryptic clues for the Dynamic Duo to follow (for some reason, tho sometimes they led to a trap!). This one time, the Riddler had a clue skywritten, but scrambled the letters. Robin: "Holy anagrams, Batman, the Riddler left a clue... but they're SCRAMBLED!! What are we gonna do, Caped Crusader??" Batman: "Easy, Boy Wonder, I'll just reach around on the BatBelt and pull out my trusty can of Alphabat Soup, and we'll figure it out!" It's around. Vegetarian vegetable or beef vegetable. Campbell's vegetarian vegetable soup has alphabet pasta in it. 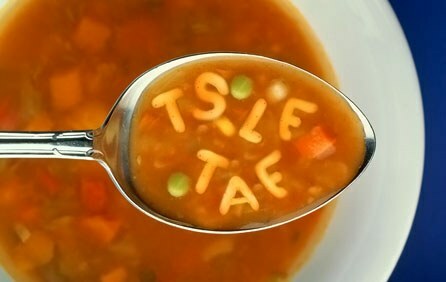 I haven't seen alphabet soup in a loooong time, but it appears that even Campbell's still makes it. Would have loved to serve it to my daughter when she was younger.